The Zip Yard, Ireland’s largest alterations and garment repair specialists, open its 50th store in Ranelagh Village in Ireland by existing franchise owner, Adrian Flanagan. 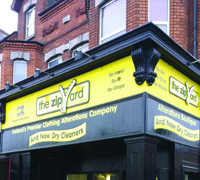 Adrian Flanagan who opened his first Zip Yard shop in Navan 2012 will now be able to offer The Zip Yard’s wide range of alteration and tailoring services, all done on site by trained professionals in a clean, purpose-built environment to the people of Ranelagh. “We planned to mark the occasion with a celebration but the shop was just too busy before the New Year to do so, but I am sure we will find time to soon,” commented franchise owner Flanagan. This store will be the first to carry out dry cleaning in their own onsite facility, adding this to their already impressive restyling and alterations offering. “It is with great pride that we at The Zip Yard announce the opening of our 50th Franchise store in Ranelagh. We currently have 22 franchised units in Ireland, 10 in Northern Ireland, and 18 in Great Britain. Along with our continued growth at home and in Britain the further growth of The Zip Yard outside of these islands is our next ambition. Don Wallace, Director at The Zip Yard said: “My compliments to Adrian, in the opening of his second Zip Yard unit. His first shop in Navan is a very successful Zip Yard business and I am in no doubt that in Ranelagh the franchise will quickly thrive. The Zip Yard has been a success since its inception in 2005. We have won numerous accolades in the franchising and general business world. The growth of The Zip Yard dream, to this, our 50th franchise would not have been possible without the dedication and hard work of all the team in our 50 shops and in our support offices in Belfast, Limerick and Leicester.